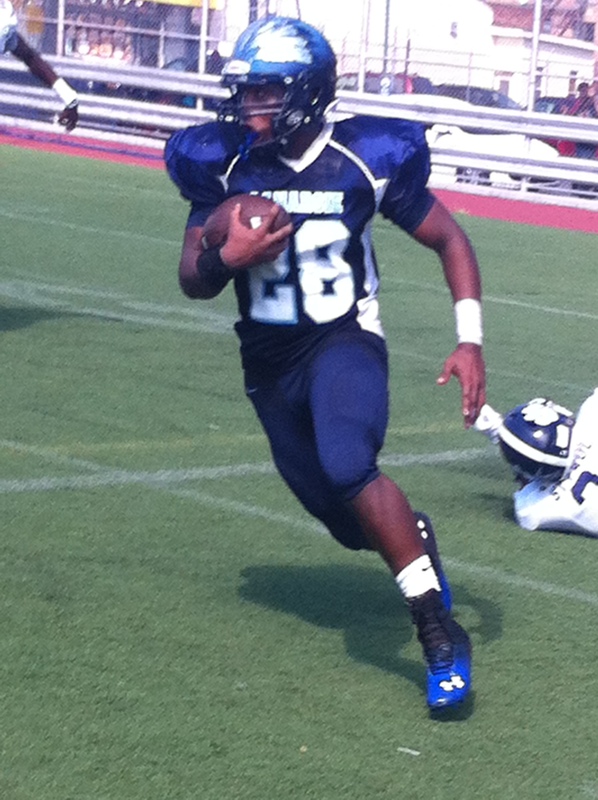 Senior Canarsie Tailback Palyte Stubbs rumbles for solid yardage in 38-0 defeat to Fort Hamilton Saturday at home. 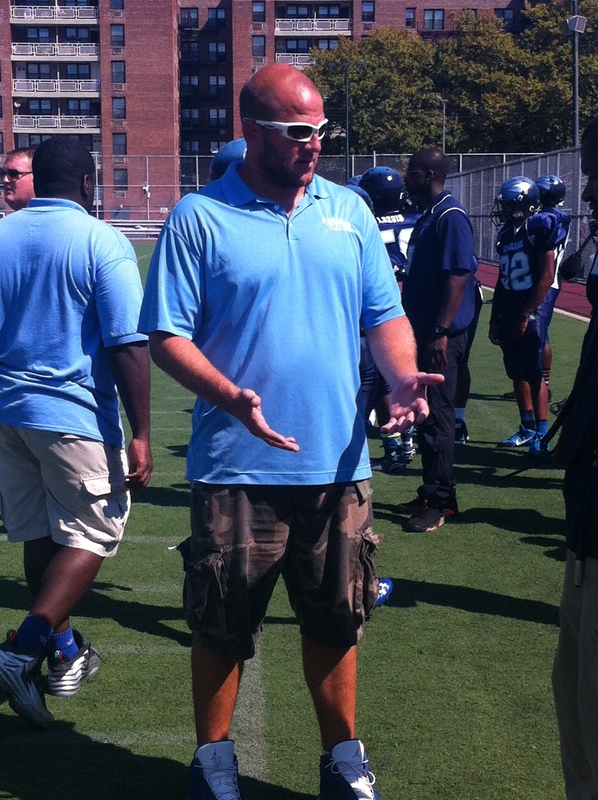 The Canarsie varsity football team knew it would be in for a tough afternoon after Fort Hamilton, a talented squad, suffered a heartbreaking defeat to Grand Street Campus last week, angering the club. Failing to muster up any offensive and playing less-than stellar defense, the pumped-up Tigers crushed the Chiefs, 38-0, Saturday in their home opener. When the opposing squad outplays you in every facet of the game, it’s hard to identify just one thing that went wrong during the contest, Canarsie Head Coach Kyle Allen said. Nevertheless, “It was definitely a lack of execution, and a lack of concentration,” both contributing factors to the lopsided defeat, as well as fatigue, he added. Things didn’t begin well for Canarsie (1-2), as Fort Hamilton blocked a punt, recovered the ball, and returned it for a touchdown. The following successful two-point conversion staked the Tigers to an early 8-0 lead in the first quarter. A rushing score pushed Fort Hamilton’s advantage to 14-0 late in the first period. The Chiefs’ first drive of the second quarter didn’t go well, as it ended with a bad snap, resulting in a safety and a 16-0 hole. Assistant Coach Chris Sino chats it up to Sidelines during break in action. Canarsie did get a measure of reprieve for the time being when senior defensive back Cyree Scott intercepted quarterback Conner Fitzsimons’ pass to thwart the Tigers’ offensive threat. After holding off the Chiefs, who committed three turnovers in the tilt, Fitzsimons vindicated himself when he broke a few tackles on his way to a 38-yard TD run and 22-0 lead. The ensuing successful two-point play widen the gap to 24-0 midway through second period. Fort Hamilton (2-1) posted 16 more second half points while blanking Canarsie the rest of the way to complete the blowout. Juniors Seba Nekhet and Troy Booker led the Tigers’ offensive with 132 rushing yards and a touchdown and 74 and three scores on the ground, respectively. Feisty senior running back Noah Solano added a combined 113 all-purpose yards in the victory. The Chiefs host Staten Island’s Port Richmond Saturday at noon.